The Citibank Preliminary Talking ATM agreement was the first agreement in the United States in which a bank agreed to install Talking ATMs. The agreement was negotiated by Lainey and co-counsel Linda Dardarian using Structured Negotiations on behalf of the California Council of the Blind and individual representatives of the blind community. In this Agreement, Citibank agreed to install five Talking ATMs. In 2001, Citibank signed the Citibank national agreement and agreed to install Talking ATMs at all branch locations in the United States. This Preliminary Agreement (”Agreement”) is entered into as of the 1st day of July 1999 (”Effective Date”) by and between Steven Mendelsohn and Kathleen Martinez (collectively, the “Claimants”), and the California Council of the Blind (”Council”) (collectively, the “Claimant Parties”) on the one hand, and Citibank, N.A. and its parents, subsidiaries and affiliates (”Citibank”) on the other hand. Each of the Claimants is a customer of Citibank, has one or more accounts with Citibank, is blind or vision-impaired, and is a person with a disability. Council is a non-profit corporation that provides advocacy services on behalf of blind and vision-impaired persons in the State of California, is dedicated to promoting the well-being of blind and vision-impaired persons, and provides information to the general public about the accomplishments, needs and contributions of blind and vision-impaired persons. Council is incorporated and has its place of business in the State of California. Among Council’s members, and those on whose behalf it advocates and provides services, are many individuals with disabilities who hold bank accounts with Citibank or who hold bank accounts with other banks and would like to utilize Citibank automated teller machines to access those accounts. Certain Citibank businesses conduct banking activities in certain states within the United States, including the State of California. Citibank operates on its banking premises in the United States certain publicly available automated teller machines (”On-Premises ATMs”). These ATMs are currently accessed by customers and ATM network users solely by touch screens. Citibank operates at third-party locations in the United States certain other automated teller machines (”Off-Premises ATMs”). 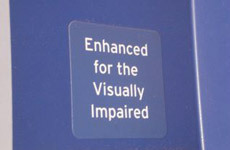 This matter began when Claimant Parties sent Citibank a letter alleging that Citibank had failed to provide equal access for blind and vision-impaired persons in California to On-Premises ATMs and proposed entering into discussions with Citibank as an alternative to litigation for resolving their claims. After receiving Claimants’ letter, Citibank informed Claimant Parties that it is Citibank’s position that its On-Premises ATMs provide equal access for blind and vision-impaired persons to Citibank’s ATM services. Citibank also stated that it had developed software for its On-Premises ATMs with input from advocacy groups for vision-impaired persons. Citibank also informed the Claimant Parties that it was willing to consider changes to the technology used by blind or vision-impaired customers at its On-Premises ATMs to make these ATMs more accessible, and agreed to develop technological enhancements for its On-Premises ATMs with input from the Claimant Parties. Citibank, with input from the Claimant Parties, has been working to develop technological enhancements for the On-Premises ATMs. Citibank and the Claimant Parties have met periodically to discuss and test various potential solutions designed to provide enhanced access for blind and vision-impaired customers at the On-Premises ATMs. After designing and testing numerous potential technological designs as possible interface solutions, in February 1999 Citibank advised Claimant Parties that it intends to pilot test a method of providing voice and sound output at the On-Premises ATMs using a “text to speech” screen reader (”Screen Reader”). The sound output is intended to be delivered through an earphone jack on the ATM. On-Premises ATMs with these features will be referred to herein as “On-Premises ATMs with Screen Readers.” Citibank further advised the Claimant Parties that, in order to pilot test such method, the On-Premises ATMs with Screen Readers would require new systems architecture and new software applications for sighted and non-sighted customers. The Parties have determined in this Agreement to set forth a schedule for further development and testing of the On Premises ATMs with Screen Readers, for negotiating a deployment schedule of the On-Premises ATMs with Screen Readers at the On-Premises ATM locations across the United States, and for negotiating about Off-Premises ATMs and their accessibility to blind and vision-impaired persons. The Parties have undertaken a two-stage negotiations process because of unforeseen issues that may affect software development and implementation and deployment of On-Premises ATMs with Screen Readers, especially as a result of the calendar change from December 31, 1999 to January 1, 2000 (hereafter referred to as Y2K). Upon execution of this Agreement, Citibank shall develop and test the On-Premises ATMs with Screen Readers as set forth herein. Citibank shall use its best efforts to have the initial software application for the On-Premises ATMs with Screen Readers ready for pilot testing by September 30, 1999. Such application shall have the following functionality for Citibank consumer deposit accounts: cash withdrawals, deposits, account information, including account balance before and after other functions are executed, and transfers of funds. The Parties recognize that initial applications with the particular functionality listed above are necessary due to the extensive amount of new systems architecture being built and new software coding being done. It is the intent of the Parties that Citibank ultimately develop, and test On-Premises ATMs with Screen Readers that have full functionality – i.e., allow the blind or vision-impaired user to access all functions available to sighted users and deploy one such ATM at each On-Premises Location. The On-Premises ATMs with Screen Readers will have earphone jacks placed in an easily locatable position and compatible with standard industry headphone cords. On or before June 30, 1999, Citibank will invite Claimant Parties and Counsel to test the initial applications of the On-Premises ATMs with Screen Readers. Citibank shall consider in good faith all written proposals given by Claimant Parties regarding operation or usability of the On-Premises ATMs with Screen Readers, provided that those comments and suggestions are consistent with this Agreement and applicable law. Citibank shall respond in writing to all written comments of Claimant Parties. The Claimant Parties acknowledge that Citibank may not be able to consider any such suggested changes for inclusion in the application scheduled for September 30, 1999, but that such proposed changes may be included at a later time. a. Citibank will place one On-Premises ATM with Screen Reader at each of two locations in Los Angeles, two locations in San Francisco, and one location in the East Bay (Oakland/Berkeley). b. Citibank will maintain the On-Premises ATMs with Screen Readers in the same manner as it maintains other On-Premises ATMs. c. Citibank will train its employees at Citibank branches at the pilot locations regarding operation and use of the On-Premises ATMs with Screen Readers deployed during the pilot. Citibank will also provide such training to all persons who answer customer service telephone calls from the public regarding Citibank ATMs in the branches of the pilot locations. d. Citibank will report to Claimant Parties in writing at least once every sixty (60) days regarding status of the pilot. These reports will be subject to the Non-Disclosure Agreement executed by the Claimant Parties and Claimants’ Counsel on or about June 19, 1997, and August 4, 1997 (hereinafter, “Non-Disclosure Agreement”). At a minimum, the report will describe the following information when applicable to the reporting period: (1) any comments from the public received by Citibank regarding the On-Premises ATMs with Screen Readers; and (2) any breakdowns in the On-Premises ATMs with Screen Readers beyond routine maintenance and repair. It is specifically understood and agreed that Citibank’s ability to maintain the pilot continuously and without interruption is subject to limitations and restrictions that may arise as a result of unknown Y2K issues. In the event that Citibank, exercising reasonable business judgment, believes that such issues impact its ability to comply with its obligations regarding the Pilot Program, Citibank shall provide written notice to the Claimant Parties and Counsel. Such notice shall provide Citibank’s best estimate as to how long the impact will be expected. During the term of this Agreement, Claimant Parties shall cooperate with Citibank regarding the accessibility of Citibank ATMs, and shall refrain from filing any complaint against Citibank and from providing any assistance or aid to any other person or entity with respect to any claim against Citibank regarding the accessibility of ATMs. In addition, during the term of this Agreement, Claimant Parties shall neither solicit other persons to become Claimants in this matter nor provide any assistance or aid to any other person or entity with respect to any claim against Citibank regarding the accessibility of ATMs. It shall not constitute solicitation or assistance under this paragraph for Claimant Parties to provide identifying information about Claimants’ Counsel to other persons in response to unsolicited inquiries about this matter or to discuss the terms of this Agreement in a manner consistent therewith. Neither this Agreement nor any document referred to herein nor any action taken to carry out this Agreement, is, may be construed as, or may be used by Claimant Parties, or any of them, as an admission against Citibank of any fault, wrongdoing or liability whatsoever. On a date between February 1 and March 1, 2000, to be agreed upon by the Parties, the Parties shall begin negotiations in good faith to enter into a further agreement regarding the issues set forth in paragraph C.2 herein. Such negotiations shall continue for a period not to exceed sixty (60) days (”Negotiation Period”). During the Negotiation Period, the Parties shall negotiate in good faith regarding the following: (i) a schedule for deployment of one On-Premises ATM with Screen Reader at each Citibank location with On-Premises ATMs; (ii) the dates upon which incremental software releases with additional ATM functionality will be added to such On-Premises ATMs until those On-Premises ATMs with Screen Readers have full functionality; (iii) scope and content of training that Citibank will provide to its employees who will have responsibilities for the On-Premises ATMs with Screen Readers; (iv) whether and when the Screen Readers may be added to Off-Premises ATMs or whether there is an alternative technology to provide access to Off-Premises ATM services to persons with vision impairments; (v) the amount and manner of any compensation to be paid to any of the Claimant Parties and the amount of reasonable attorneys’ fees, litigation expenses and costs to be paid to Claimants’ Counsel for work performed in this matter; and (vi) the scope of the releases and covenants not to sue. The Parties expressly recognize that the Claimant Parties will seek reasonable attorneys’ fees, litigation expenses and costs for work performed both in negotiating this interim agreement and negotiating a further agreement pursuant to this Section. If the parties shall fail to reach a definitive agreement by the expiration of the Negotiation Period, the term of this Agreement shall expire. Consistent with the Non-Disclosure Agreement executed by the Claimant Parties, neither Claimant Parties nor Counsel shall disclose the negotiations regarding the Agreement to any other person or entity other than the consultant retained by Claimant Parties whose identity has been disclosed to Citibank prior to execution of this Agreement, without the written consent of Citibank. Claimant Parties agree that the Joint Press Release attached as Exhibit A hereto will be the only press release issued by any or all of them regarding this Agreement. If either Citibank or the Claimant Parties has reason to believe that a dispute exists, such party shall give prompt written notice to the other party, including: (a) a reference to the specific provisions of the Agreement that are involved; (b) a statement of the issue; (c) a statement of remedial action sought by the initiating party; and (d) a brief statement of the specific facts, circumstances and any other arguments supporting the position of the initiating party. Within two weeks of receipt of the notice provided by paragraph E.1, the Parties shall informally meet and confer and attempt to resolve the dispute. As part of the meet and confer process, the Parties shall exchange relevant documents and/or other information and engage in informal discovery in an attempt to resolve the issues in dispute. If the meet and confer does not resolve the dispute within two (2) weeks, the matter will be submitted to mediation before a mediator mutually agreed upon by the Parties to be paid for by Citibank. If the mediation does not resolve the dispute within thirty (30) days of the first mediation session, or if the mediation reaches an impasse before the expiration of the 30-day period, this Agreement shall be deemed terminated. The terms of this Agreement, and the provisions thereof, shall be interpreted and applied pursuant to the laws of the State of California. This Agreement shall bind any assigns and successors of the Parties. Each Party shall promptly notify all Parties of the name, address and phone number of any successor or assign. In witness whereof, the Parties have caused this Agreement to be duly executed as of the date set forth below. By: Arlene B. Mayerson, Esq. This document is the first legal agreement in the United States about Talking ATMs. The agreement was signed by Citibank, the California Council of the Blind, and blind bank customers. No lawsuit was filed. Instead, a formal process known as Structured Negotiations was used. Lainey Feingold and Linda Dardarian were the lawyers for the blind community.